The term “samurai” is one we readily associate with Japan. Roughly translated as “those who serve,” the term refers to armed supporters of wealthy landowners going back to the late 8th century AD. Over time, the samurai gained power and became warrior-administrators during a period known as the Age of the Samurai. For almost seven centuries, from 1185 to 1868, samurai were closely involved in the government of Japan. This extensive period of history can be divided into three parts known as shogunates, a term referring to military rule. From 1185 to 1333, the Minamoto family founded a government in Kamakura, a city south of modern Tokyo. This governing family and its network of samurai successfully resisted two Mongol invasions in 1274 and 1281. Weakened by these attacks, however, the Kamakura government was replaced by the Ashikaga shogunate, who ruled from 1336 to 1573. Local lords and their samurai became very powerful during this time. Traditional Japanese art forms, such as the tea ceremony, rock gardens, and flower arranging flourished. The third and last shogunate was that of the Tokugawa family. Their rule extended from 1600 to 1868. For the first time, samurai learned how to rule through civil means rather than by military force alone. The arrival of Commodore Perry of the U.S. Navy in 1853, and the subsequent opening of Japan to the outside world, eventually overturned seven centuries of samurai rule. 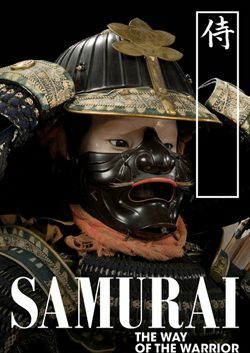 The Houston Museum of Natural Science is proud to host Samurai: The Way of the Warrior, an exhibit of exquisite objects related to these legendary warriors. Among these are full suits of armor, helmets, swords, sword-hilts, and saddles, as well as exquisite objects intended for more personal use such as lacquered writing boxes, incense trays and foldable chairs. The exhibition comes to the Houston Museum of Natural Science from one of the most important private Samurai collections outside Japan, known for the number and quality of its pieces. Organized by Contemporanea Progetti SRL with the Museo Stibbert, Florence, Italy. Local support is provided by Kuraray. Curator: Dirk Van Tuerenhout Ph.D.
Dr. Van Tuerenhout joined the Museum staff full-time in 1999. Dirk Van Tuerenhout, Ph.D., Curator of Anthropology Dr. Van Tuerenhout is an expert in human cultures, especially those of Latin America, and is well versed in archaeology and anthropology. He took part in excavations of Late Roman ruins in his….